Objective: Neuroinflammatory disease is a general term used to denote the progressive loss of neuronal function or structure. Many neuroinflammatory diseases, including Alzheimer’s, Parkinson’s, and multiple sclerosis (MS), occur due to neuroinflammation. Neuroinflammation increases nuclear factor-κB (NF-κB) levels, cyclooxygenase-2 enzymes and inducible nitric oxide synthase, resulting in the release of inflammatory cytokines, such as interleukin-6 (IL-6), interleukin-1β (IL-1β) and tumor necrosis factor-α (TNF-α). It could also lead to cellular deterioration and symptoms of neuroinflammatory diseases. Recent studies have suggested that curcumin (the active ingredient in turmeric) could alleviate the process of neuroinflammatory disease. 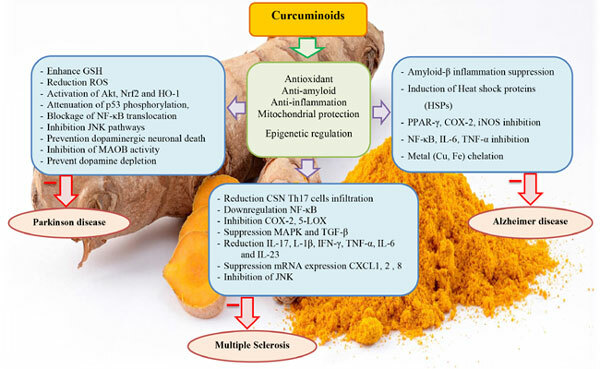 Thus, the present mini-review was conducted to summarize studies regarding cellular and molecular targets of curcumin relevant to neuroinflammatory disorders. Methods: A literature search strategy was conducted for all English-language literature. Studies that assessed the various properties of curcuminoids in respect of neuroinflammatory disorders were included in this review. Results: The studies have suggested that curcuminoids have significant anti- neuroinflammatory, antioxidant and neuroprotective properties that could attenuate the development and symptom of neuroinflammatory disorders. Curcumin can alleviate neurodegeneration and neuroinflammation through multiple mechanisms, by reducing inflammatory mediators (such as TNF-α, IL-1β, nitric oxide and NF-κB gene expression), and affect mitochondrial dynamics and even epigenetic changes. Conclusion: It is a promising subject of study in the prevention and management of the neuroinflammatory disease. However, controlled, randomized clinical trials are needed to fully evaluate its clinical potential. Neuroinflammatory disorders, Alzheimer's disease, Parkinson's disease, multiple sclerosis, curcumin, nanocurcumin.